With a little bit of cash and a lot of ingenuity, you can transform your child’s room into a dream come true. 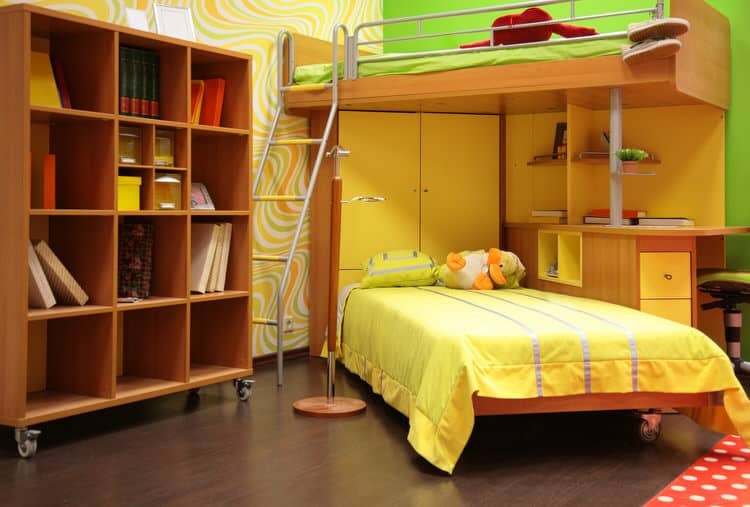 Your kid’s bedroom should be a place that sparks imagination and creativity. Incorporate the things they love into the design. A chalkboard for an artist, a castle for a prince or a stage for a ballerina could be enough inspiration for the entire room. Remember, they don’t stay little forever, so use this time to design a magical bedroom they’ll remember for years to come. Also keep in mind how quickly their tastes will change. You don’t want to invest too much time or money on the project. Determine a budget before you start to keep spending in check. Branch out in your child’s bedroom with whimsical wall art. Painting is one of the easiest ways to give a room a new look. Try it in your toddler’s room by painting a tree and woodland companion scenes. This playful touch can be changed when your little one outgrows it. The designer for this little girl’s room created a Parisian pink bedroom chocked full of elegance using a pink, green and brown color palette. Coordinating fabrics in a variety of textures and patterns create a look that’s visually stimulating and oh-so girly. The fabrics were collected by the homeowner and give the mini-boudoir a dose of feminine chic. Strong colors rule this geometric bedroom. 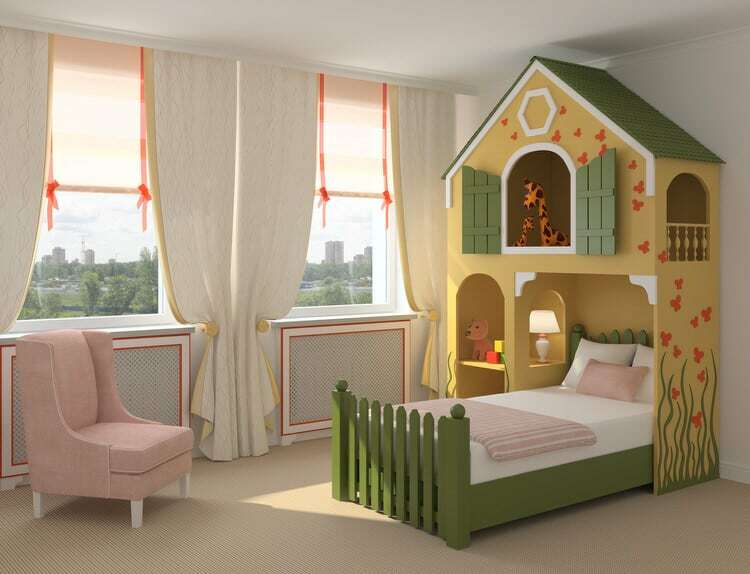 Suitable for a boy or girl, this modern design includes separate sleeping and lounging areas. The boldness of the colors and pattern lend an adult feel to the space. 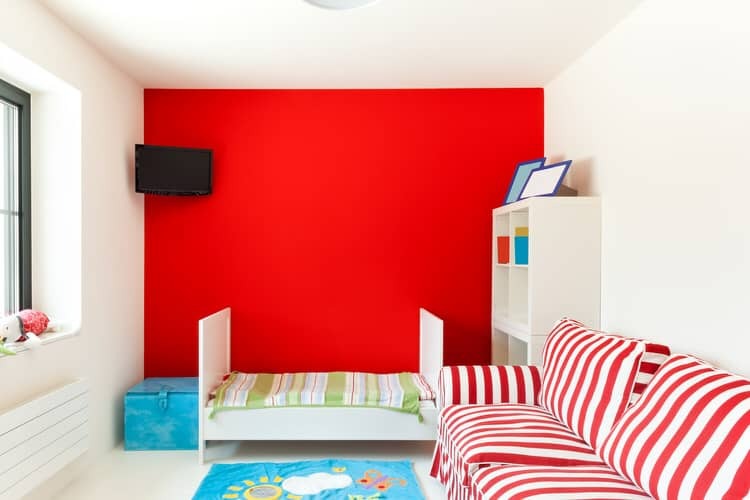 The solid red focal wall beckons the kids into this energetic space. 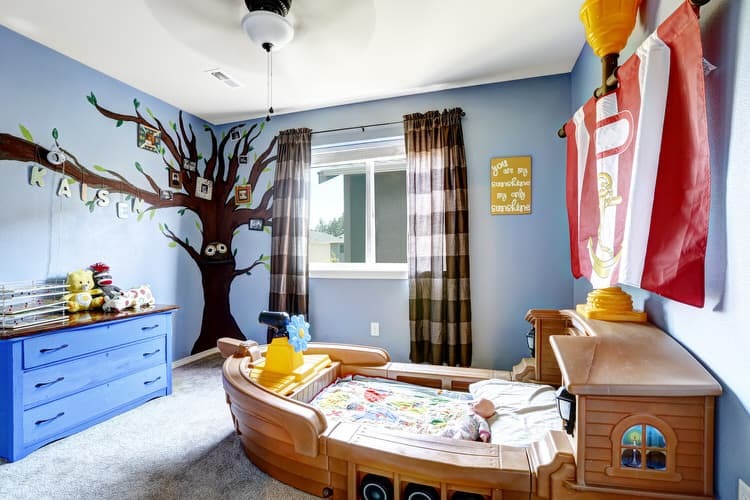 The pirate theme of this boy’s room focuses on every little detail, from the intricate construction of the boat bed to the animated tree on the shore. A bright blue dresser provides plenty of storage for the pirate’s booty and the plaid curtains darken the room for sweet dreams on the high seas. 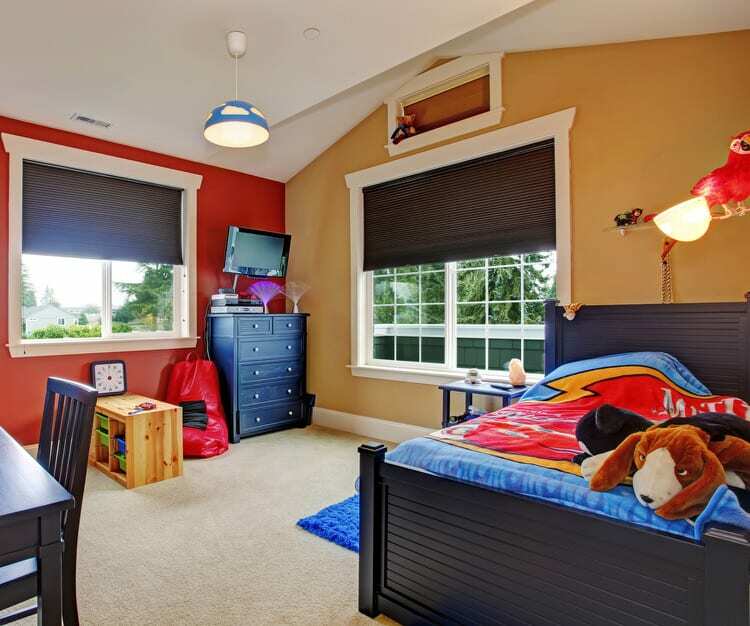 While not an in-your-face themed bedroom, the primary colors and black-and-white accents definitely hint that someone in this household is a pint-sized racing fan. Fitted with a large wardrobe, desk, beanbag chair and bed, this lucky little one has everything they’ll need for hours of racecar pretend time. Don’t worry that you’re not super crafty or a big DIYer. 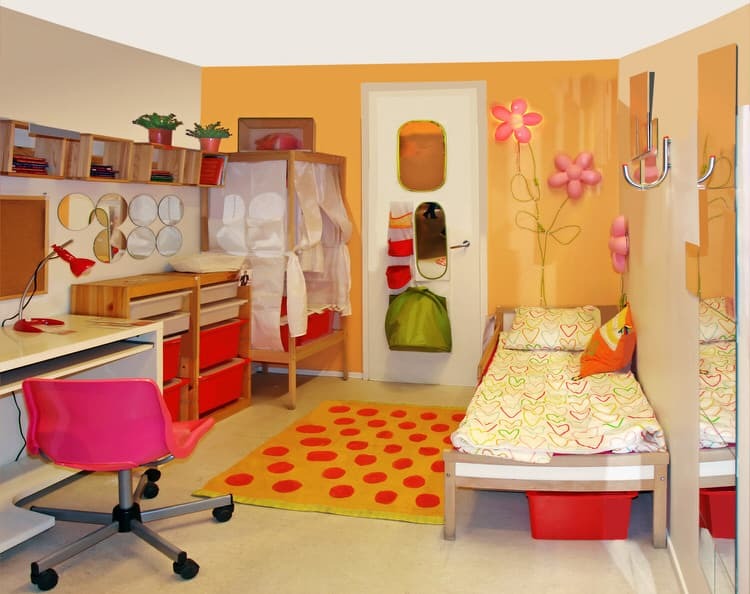 A little creative know-how can save you lots of money when it comes to decorating your kid’s room. A mother-daughter team pulled this room’s design together in one weekend. Mom painted the walls and with a few stencils and white paint they created the paisley pattern. An upholstered piece of plywood was easily transformed into a bright pink note board hung above the bed. 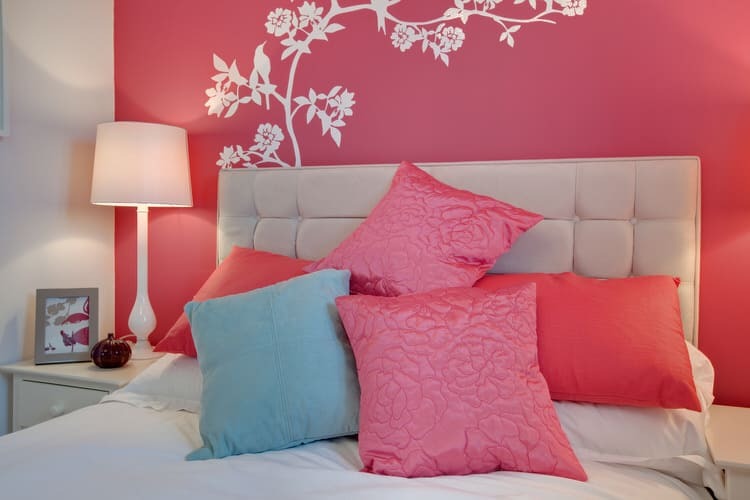 Rather than painting the bedroom walls a single color, why not get creative with paint and go for three or four or more? 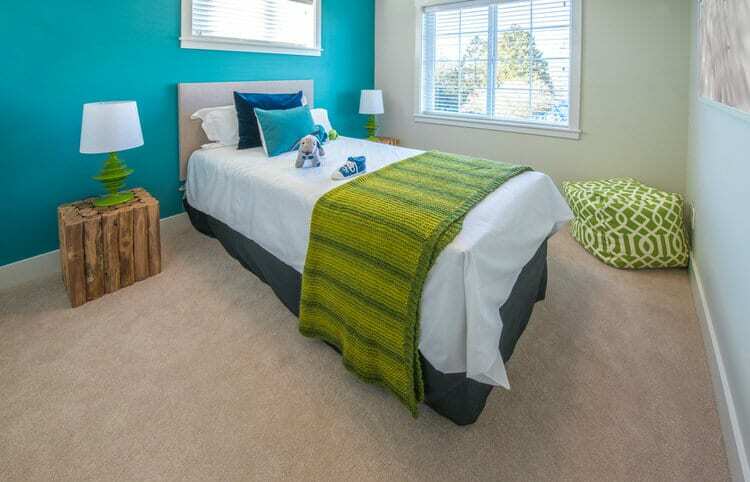 Horizontal stripes create a dynamic bedroom for a little trendsetter. The wall was striped with four intense earth tones. The result is vibrant, young and stylish. Step right up boys and girls, the circus is in town! This nonliteral take on the circus theme is a thing of beauty to behold. Gone are the garish colors and parade of stuffed animals. In their place are neutrals, soft yellow bedding, gauzy white window curtains and whimsical circus-like awnings hung over black iron beds. A carousel rocking horse completes the understated bedroom design. Creativity thrives in the bright pink bedroom. The dresser/vanity is painted in fanciful scenes and the dollhouse is just waiting for a junior interior designer. This girl’s bedroom has a palette that covers a spectrum of hues from corals and pinks to greens and blues, allowing a great deal of latitude for furnishings and accessories. The time has come to transition your child’s bedroom from toddler to big kid. You want furniture that looks good and that will hold up to the rigors of boyhood. A great choice is a solid oak storage bed that’s designed to provide a place for blankets and bedding. Your little girl is suddenly interested in fashion. My how time flies! Give her a room combining comfort, color and high style. The orange two-tone wall effect is the ideal backdrop for orangey-coral puckered duvet cover, matching shams and floral pillow cases. Actual hand-drawn fashion illustrations are color coordinated and a tribute to your young one’s newly acquired sense of style. 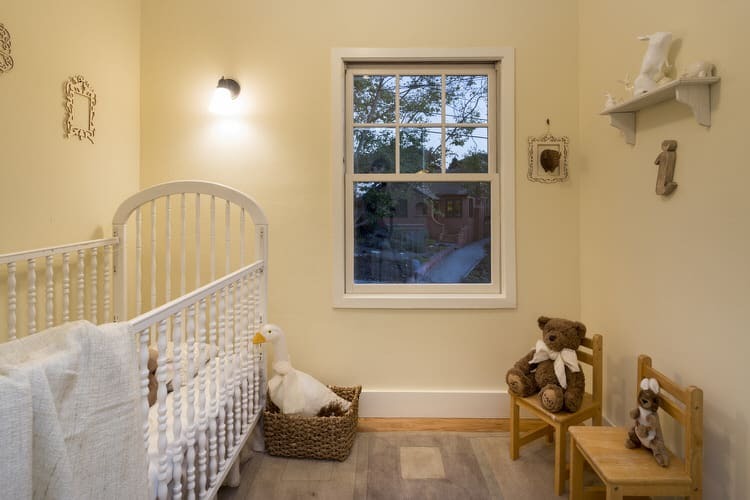 This eco-friendly nursery gets abundant daylight and fresh air through its well-positioned window. It is swathed in creamy white non-toxic, mineral-based paint and hardwood flooring with a low-VOC sealer. Handcrafted toys, artisan furniture and European stuffed animals sit in wait for their little friend to awaken from naptime. Organic linens and mattress fill are healthy and comfortable for baby. Modular furniture allows you to grow with your kids. This contemporary Swedish design incorporates lots of storage, display space and a workspace into a single unit that can be reconfigured and added to as needed. The bedroom is as attractive as it functional. 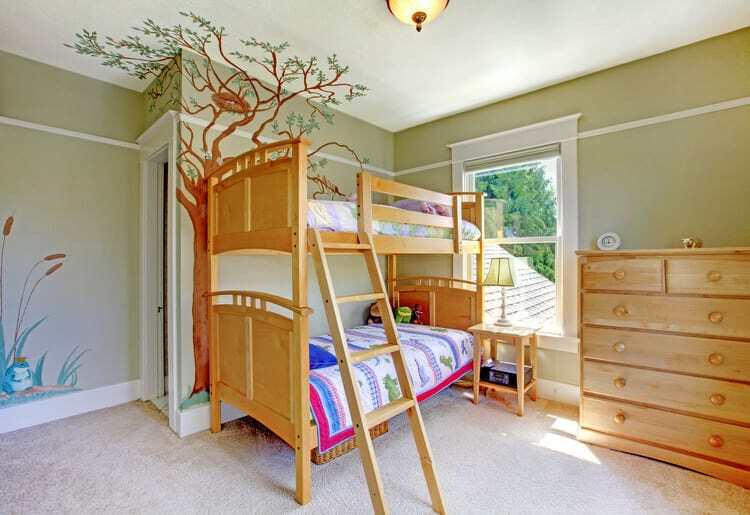 This boy’s bedroom has a decidedly grown up feel. Mom just traded the toddler bed and playroom elements for a full-size bed, desk and bookcase. Even though he’s just started school, this modern furniture collection can easily take him through his college years and beyond. 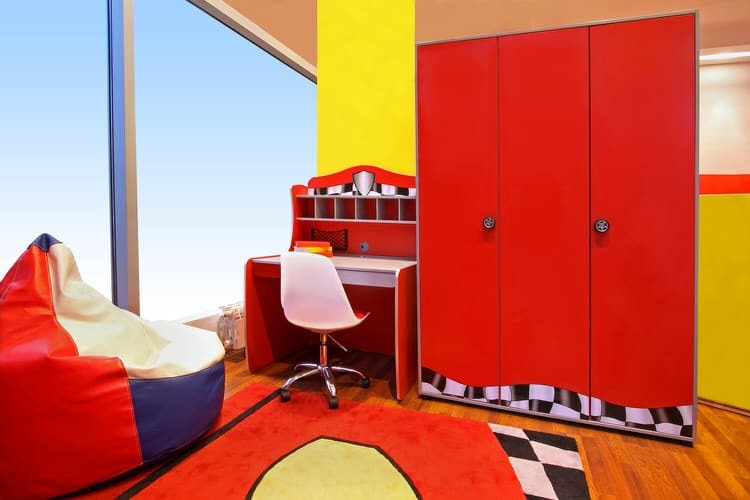 Kick off your kid’s bedroom decorating project with a fun and imaginative color palette. Make intelligent choices that include quality furniture construction, ample storage, a comfortable bed and room enough for kids to be kids. 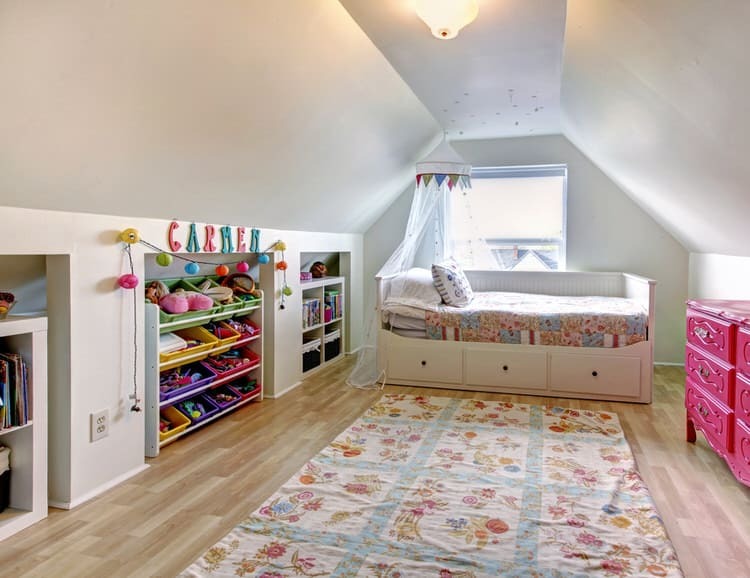 Transform your little one’s bedroom into a storage wonderland with loads of built-ins. This smart space includes a bed with storage drawers for everything from toys and clothing to books and baby dolls. The large built-in bays house shelving that accommodates bins for every matter of art supplies and games. The center of the room is open to allow room for playtime. Searching for a kid-friendly color palette? Take a look at their favorite bedding and stuffed animals! 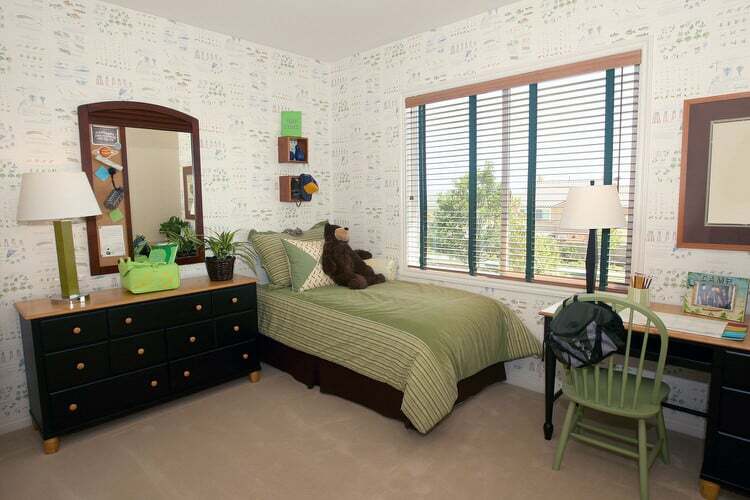 Inspiration for this boy’s room sprung from the graphic design on the comforter and the stuffed beagle toy. Red and gold from the bedding looks great on the walls when contrasted with off-white trim and black furniture. 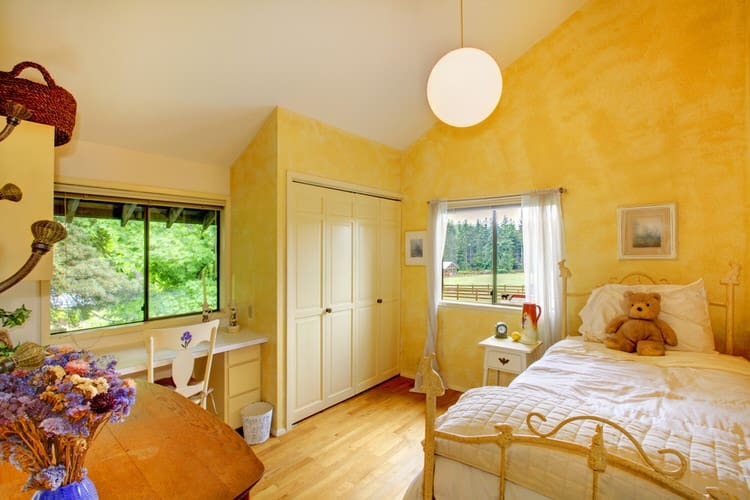 Sunshine yellow was what the little occupant of this bedroom requested and that’s just exactly what Mom delivered! A rough texture on the walls gave the yellow paint and glaze combination depth and dimension. The previously white iron bed was given a quick spray of yellow paint as well. Bedding, artwork and accessories were all selected for their ability to play well with the dominant yellow color. A gauzy ceiling-installed white canopy is a precious touch for a newborn’s nursery. Not only does it give the crib a princely appeal, it also balances with the height of the wardrobe on the opposite side of the room. Simple furniture in bright white looks fresh with the turquoise wallpaper pattern and accents throughout the room. You didn’t realize you were the parent of an up and coming Georgia O’Keefe until the artwork began to trickle in and take over every surface of the house. Give your refrigerator a break and decorate her bedroom with her very own masterpieces! String a wire from wall to wall above the bed for a cute and inexpensive way to showcase the art. 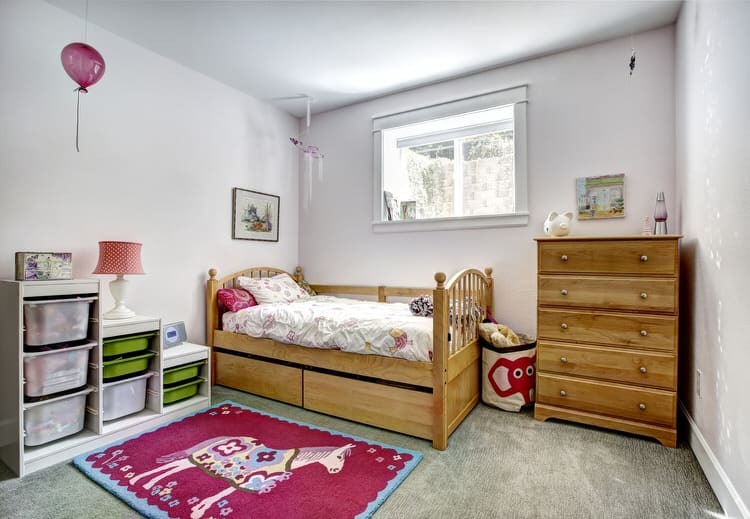 From subtle yellow floral wallpaper to the fancy bedding to the crystal chandelier, this little girl’s bedroom is anything but plain. The beautiful tufted headboard, French country dresser and armoire, and lace canopy give the space a soft, airy and antique feel. While shared bedrooms can be fun, it is paramount to choose a decorating scheme that is agreeable to both parties. The yellow and blue color palette is fairly difficult to work with, but that’s what the young brothers wanted. 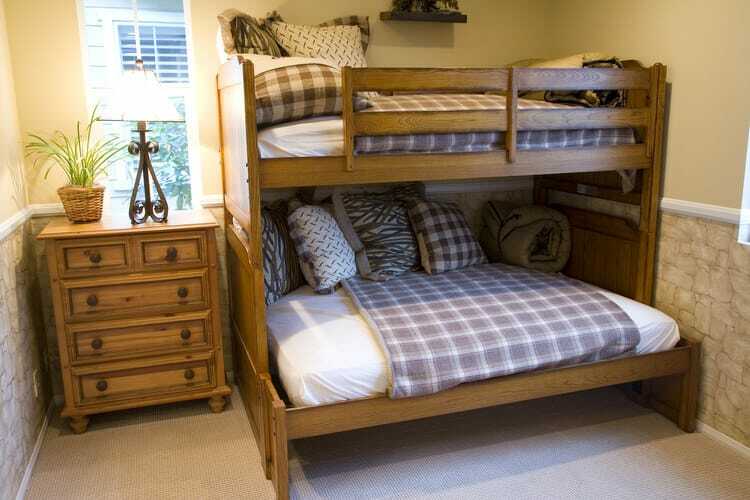 The durable furniture and sturdy beds will likely last them well into their teens. This bright and white bedroom command center is for the serious student. Tons of work and computer space combine effortlessly with bedroom storage, TV viewing and sleeping areas. White furniture pieces, a painted plank ceiling and birch floors blend brilliantly with the subtle floral wallpaper. In this home, there’s no excuse for not getting homework done! Pale pink walls help make this space a color chameleon. They look anything but bland when decked out in bold colors and cheerful accessories. Bright blue, lime green, perky pink and citrus yellow create a spirited color scheme. The pale pink paint plays a neutral role when paired with these bright hues. This space is part dollhouse, garden room and all around adorable. The father of this lucky girl is a master carpenter. He designed and built the bed to his daughter’s exacting specifications. The imaginative two-story house features bright yellow paint, green trim, a picket fence, flowers and personality plus. The coordinating window and wall treatments in the bedroom add to the fairytale charm. 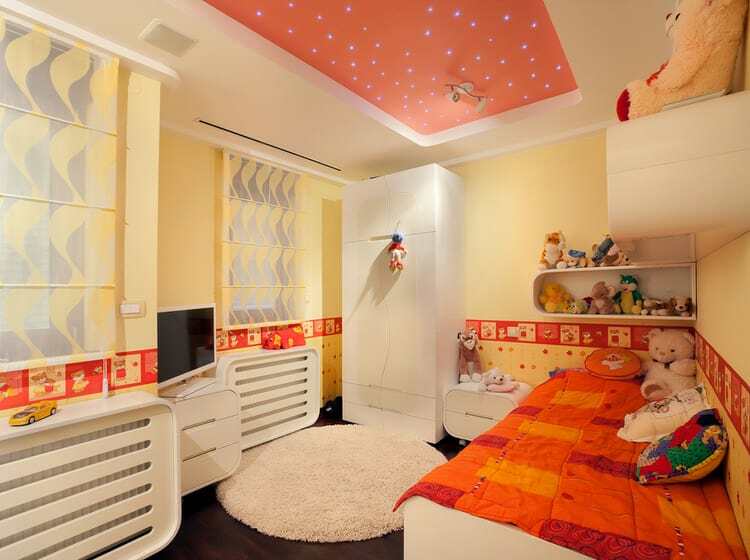 With a small budget and creativity to spare, you can easily transform your child’s bedroom into a magical place. Here, a crafty mom created a delightful design her daughter loves. The rose petal wall color is reflected onto the ivory ceiling, which was painted in semi-gloss. A flea market chandelier lights the bed area. The bedframe received a coat of black chalk paint. The best part of the room in our opinion is the hot pink coat rack wrapped in twinkling fairy lights! 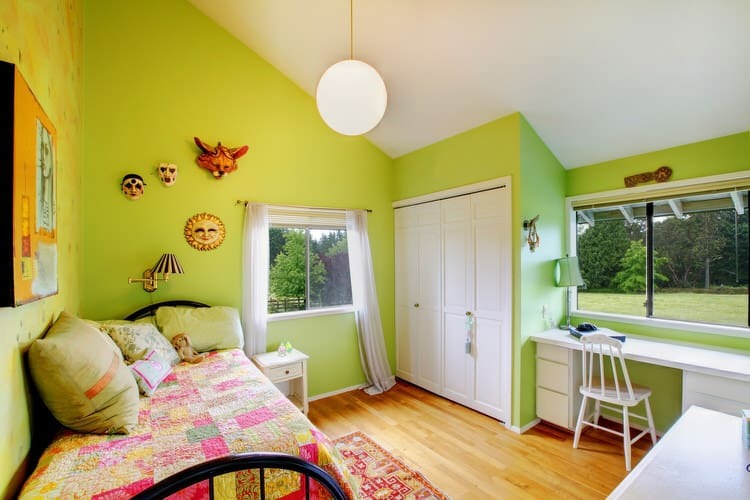 This girl’s room gets a punch of color with limeade green paint. Lime and pink create a preppy bedroom that’s sure to please. A patchwork bedspread, whimsical masks as wall art and a big bright picture window let plenty of sunshine into this citrus-y retreat. 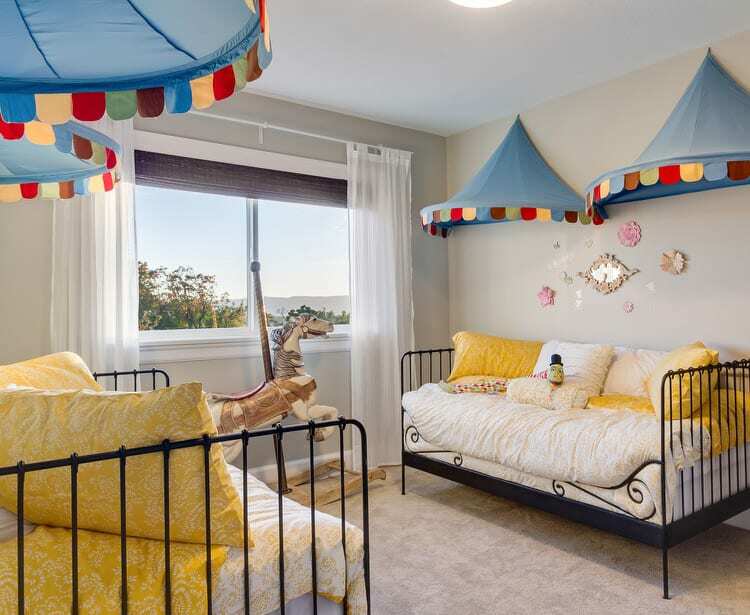 This young soccer star’s room is a tribute to her love of the ocean. Pale sea green glass and her favorite sport were the inspiration for the bedroom. The mid century lamps are the perfect color green and look quite stylish with black drum shades. Creamy gauze bedding is the ideal choice for the pastel greens of her blankets and pillows. Consider defining a small room with a high-contrast paint effect. Painting the headboard wall a bold turquoise, the opposite walls a beachy beige and the foot wall a soft aqua. This color combo will visually expand the space and makes it easy to accessorize. 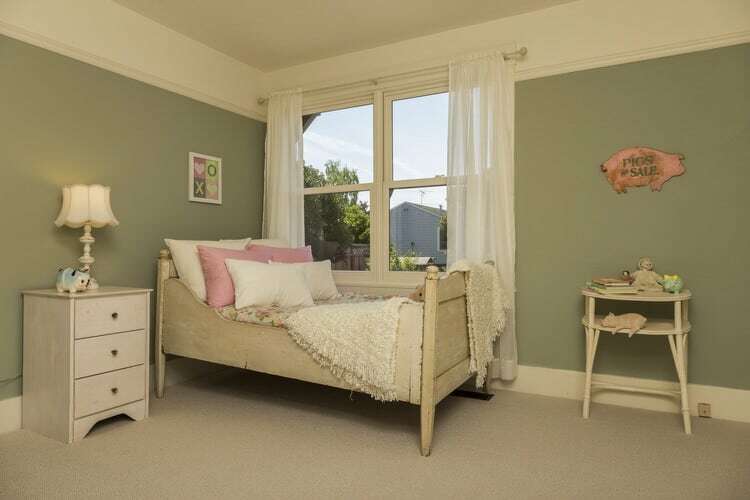 This bedroom is a bit of Victorian whimsy for one lucky San Francisco girl. The burnt orange damask wall treatment was painstakingly created with stencils. Matching pillows and throws adorn the twin beds. The built-in wardrobe features glass front door to make clothing selection easy. The antique beds and Bombay chest were purchased in Europe and add the perfect touch to this ornate decorating style. If space is tight in your little one’s bedroom, try moving the bed against a wall. With the bed safely out of the way there’ll be plenty of space to play on the floor. Here’s a great design tip: create the look of a sofa by mounting an upholstered queen-size headboard on the wall along the length of the bed. The bed converts to functional seating during the day and back to a bed at night. This weekend home on Nantucket Island features a nautical themed bedroom that takes its design cues from the rest of the house. Walls and flooring are neutral tan and the room’s accessories are family heirlooms and treasures from local antique stores. 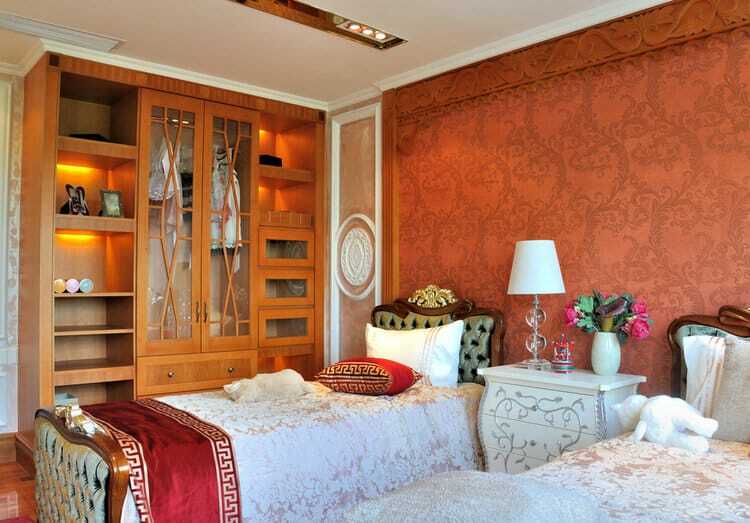 The twin bed features a sailboat design. 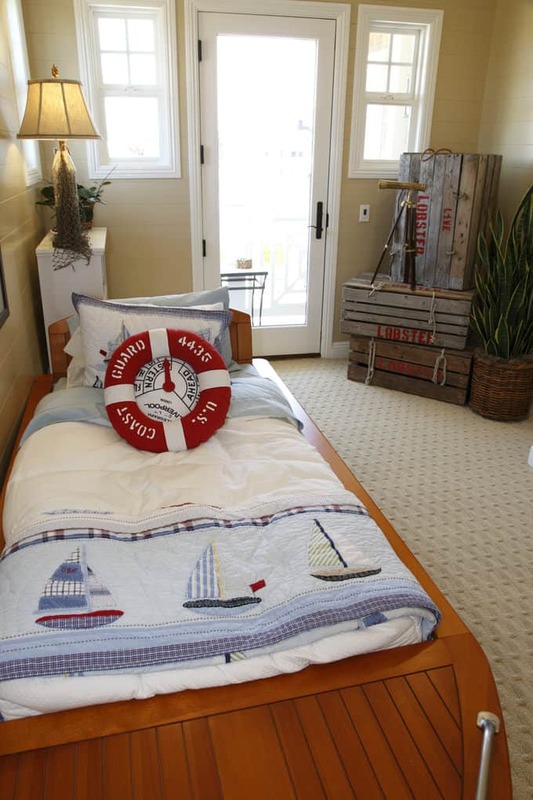 The red lifesaver is actually a decorative pillow that buoys the boating motif. This bedroom is all male. From the diamond plate tool chest bedside tables to the soccer accessories, there’s no question as to what this young man’s interests are. 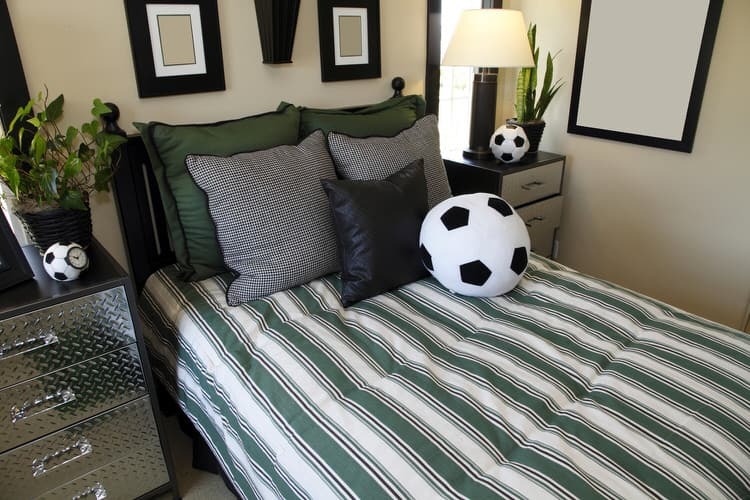 The green and white striped Ivy League bedding and coordinating green and gray pillows make a masculine statement against the tan walls and black accents. Blue is just as precious for a girl’s room when the accessories lean toward the feminine and romantic. Here, soft blue walls bathe the walls in pastel splendor. The ruched sky blue coverlet and white bed linens transform the bed into a fluffy cloud, while a smart drum shade pendant adds a hint of sophistication. Tailored black fabric window shades add classic contrast to the traditional design. Functional bunk beds make the perfect place for hosting a sleepover. The gender-neutral colors allow for lamps and accessories to spruce up the space without committing to a specific design theme. Butter yellow upper walls top the cork wainscoting and white chair rail. The beds are neatly dressed with plaid blankets and crisp white sheets. 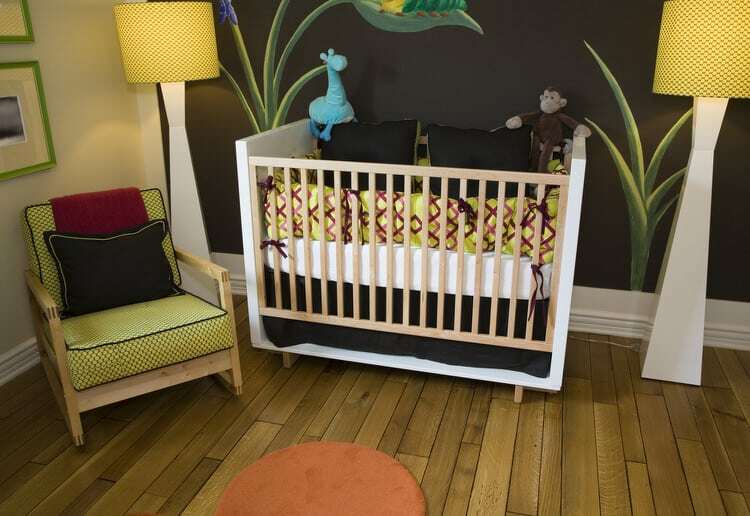 A modern twist on a jungle-inspired bedroom is an idyllic place for a baby boy to commune with nature. The playful mural on the back wall sets the stage for fun. The floor lamps resemble trees and the crib itself becomes a veritable menagerie with stuffed animal friends. The sunny orange rug and celery-green chair and bedding emphasize the natural theme. The tween years can be a nightmare, but this eclectic girl’s room is a Boho dream. The bedroom boasts lavender walls with wild purple argyle detail. Patterns and colors converge on this space in an amalgam of textures and materials. Steel lockers serve as storage and a frosted plexiglass partition separates the sleeping quarters from the on-suite bathroom. We especially heart the teal and lime green upholstered silk headboards. A springtime color palette of lemon yellow, pink, blue and white sure looks cheery in this bedroom shared by twin girls. 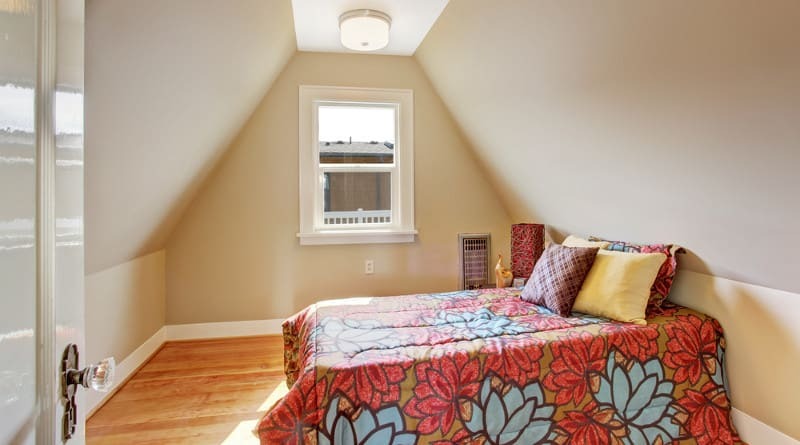 Wainscoting gives the room a traditional feel and the matching iron beds add a vintage twist. Neutral carpet warms the floor and a fanciful valance tops the window above the dresser nightstand. Soft pastels and classic style will ensure the girls’ bedroom remains a favorite for years to come. Dainty floral trellis wallpaper unifies the painted furniture pieces, bedding and curtain panels. A generous desk area looks out over the garden giving the budding authors a place to create and work on the occasional school project. 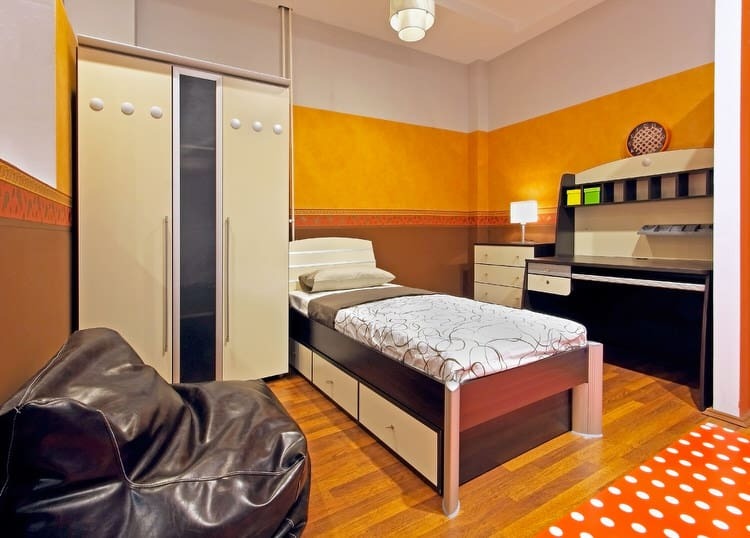 Modular furniture features clean lines and functional style, which is perfect for a kid’s bedroom. The pieces fit seamlessly into spaces of any size or shape and are known for clever storage solutions to help keep clutter at bay. The simplicity of design and timeless quality allows the furniture to speak for itself. This bright green and white bedroom is a multitasking wonder. The rolling cube bookcase can be repositioned at will. The loft space above the bed is a great spot to chill and practice the guitar before hitting the books. Speaking of homework, the space-saving desk is a valuable component of this interchangeable bedroom system. The girl’s room has a mod, 60s vibe and that’s why we named it “flower power” to the max! 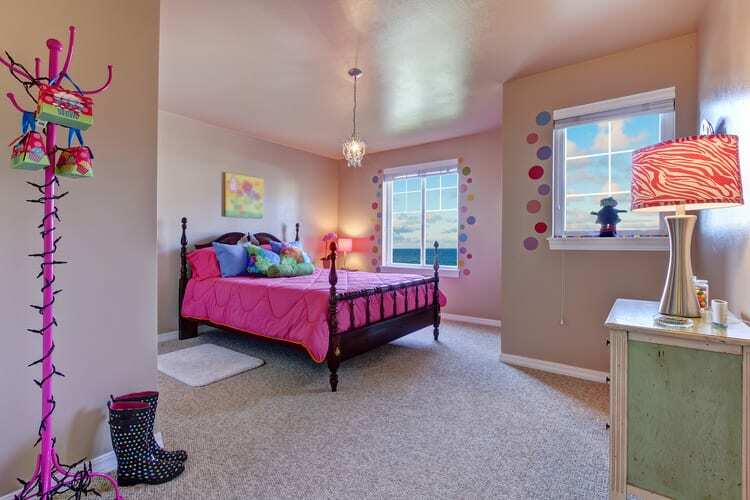 The cool bedroom features brightly colored blooms covering the groovy comforter and curtains. The psychedelic wallpaper border adds righteous detail and is really outta sight. 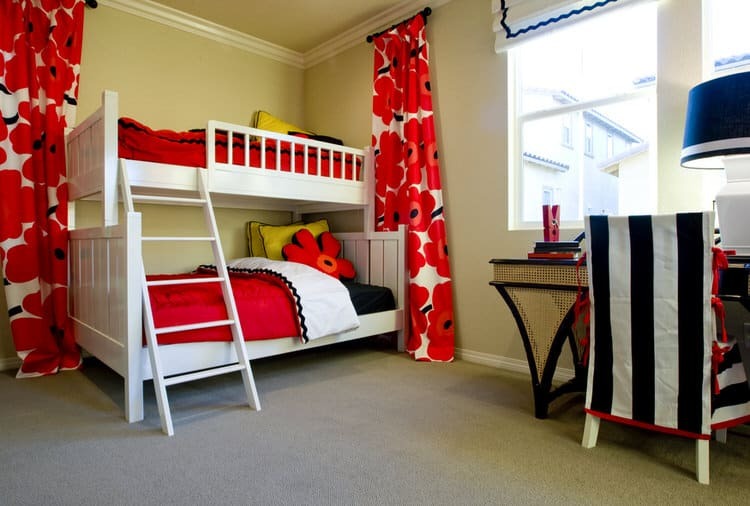 This bedroom would appeal to boys or girls who like the graphic and colorful combination of red, white and black. The white bunk beds are a great choice now and in the future. 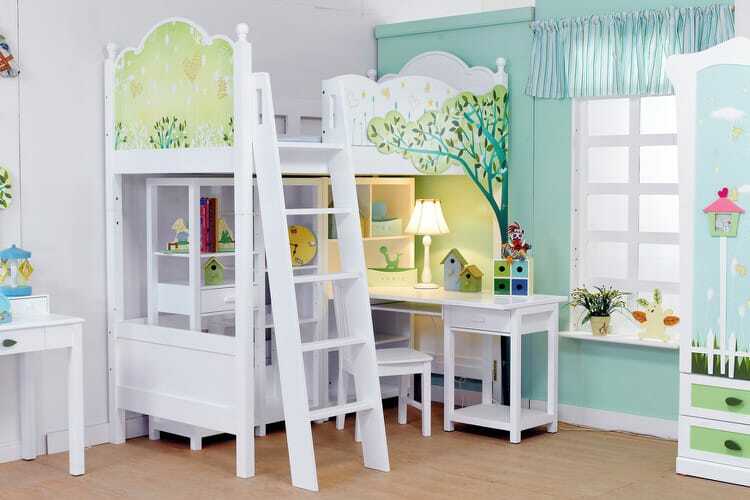 The bedframes combine to create a full-size bed when the little one outgrows the need for the double-decker. The custom bedding, curtain treatments, roman shades, slipcover and lampshade are all things we’d like to have in our room too. This is one lucky kiddo! The studious boy who occupies this bedroom has it made. The well-equipped desk has plenty of task lighting and space for catching up on the day’s homework. 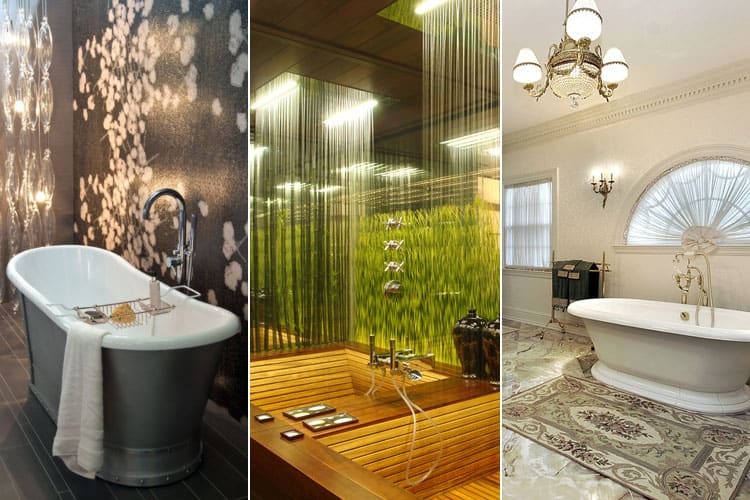 The greens in the room were inspired by the subtle pattern in the wallpaper. He will outgrow the bed someday, but the furniture pieces will serve him for years to come. This is for the tween guy that is lover of all things that cycle. 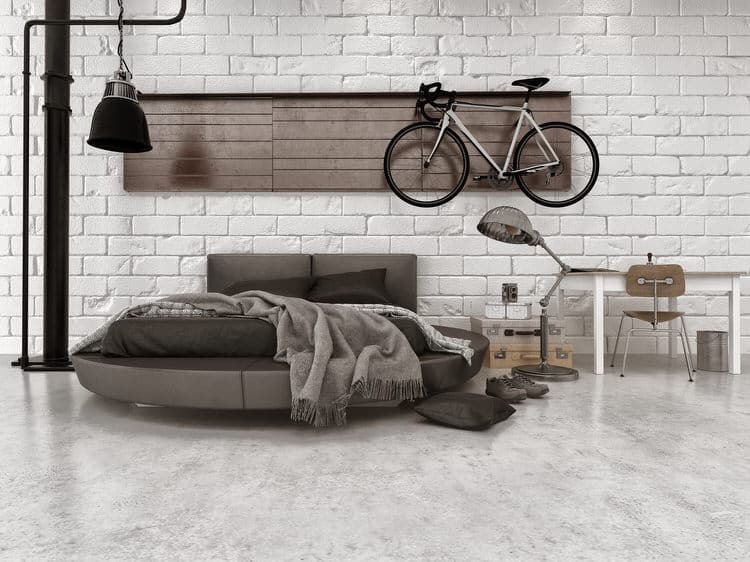 The inflatable bed makes a big statement in the loft bedroom, as does the bicycle art piece mounted on the wall and the oversized task floor lamp. The industrial pendant lights up the room and a simple desk and chair provide a place to catch up on homework after an afternoon of trail bike shredding with dad. What can we say about this blue and yellow bedroom? It is a classic color combination that will be in style years from now. Everything in the room is a delight—right down to the adorable bears waiting for their Goldilocks to test out the bed! Tiffany blue appeals to big girls and little girls alike. Try combining the subtle hues of blue with spring green and yellow to create a painted fantasy garden in this dainty bedroom. She will love the look—and mom will too. A quaint, vintage-style room was achieved on a shoestring budget with some bargain furniture, quart of sage green paint, and lots of lace and pink bedding. The furniture pieces were mismatched garage sale finds. They became a coordinated set thanks to off-white paint and antiquing glaze. The resulting little girl’s bedroom is simply adorable. The daybed and floating shelves make an adorable little girls’ room as functional and efficient as it is charming. The off-white color palette and black accents will suit her well into the future. The room will grow right along with her thanks to the neutral striped walls, classic design and textural bedding. This sophisticated bedroom idea came straight from the mind of a designer who wanted to surprise her daughters while they were away at summer camp. She got busy painting the walls a deep tan that tied in perfectly with the ceramic tile flooring. Empty black pictures frames adorn the focal wall. 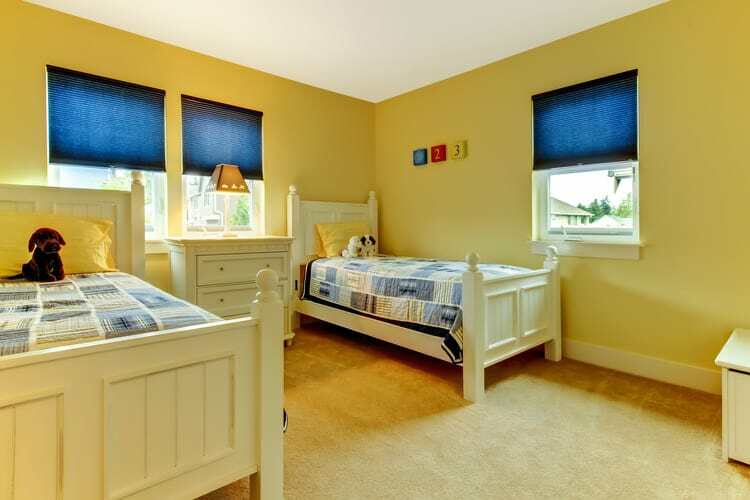 Traditional beadboard beds and bench seating provide sleeping and lounging areas for the girls. An exquisite mix of pattern and color complete the space.